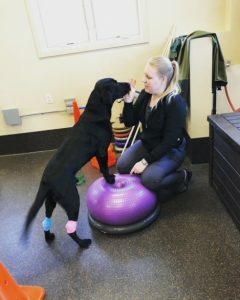 Our physical rehabilitation team are Certified Canine Rehabilitation Therapists and Assistants through the Canine Rehabilitation Institute (CRI). This certification process requires extensive and advanced training, as well as passing a rigorous examination reviewed by a certifying board. 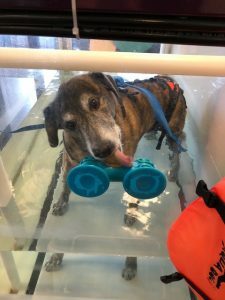 Only veterinarians and licensed veterinary technicians with proper training and expertise in the treatment and care of chronic debilitating conditions, injury, and post-surgical care should perform the rehabilitation of animals. 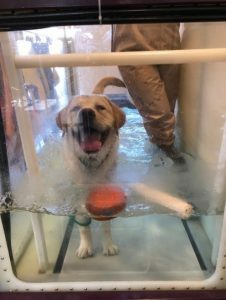 In our rehabilitation facility, we are able to perform hydrotherapy (underwater treadmill) sessions, therapeutic and diagnostic ultrasound, E-stim, and laser therapy sessions for dogs with orthopedic, neurologic, geriatric or weight concerns. 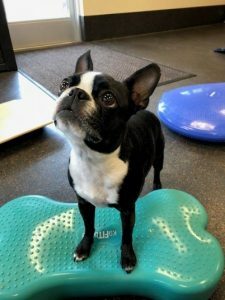 Improve the mental well-being of pets by providing comfort and quality exercise during the recovery period. Restores range of motion in joints. Prevent muscle loss during recovery. Improve strength and function of weak or paralyzed limbs while preventing contracture of affected muscles. 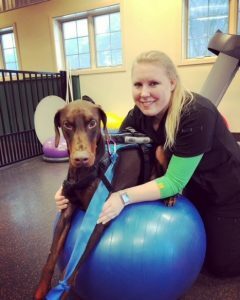 Maximize postoperative recovery and return your pet to its normal daily or sporting activities and capabilities. What Conditions does Physical Rehabilitation Help? Obesity, geriatric support, athletic conditioning, seasonal sports conditioning, mental stimulation and exercise for home alone pets. 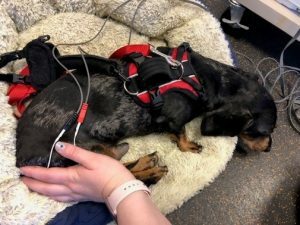 Postoperative herniated disc, vertebral fractures, degenerative spinal cord conditions, neuropathies, spinal trauma, spinal arthritis, geriatric weakness. 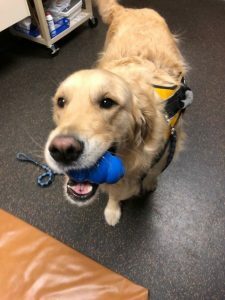 Postoperative cranial cruciate, hip dysplasia, patellar luxation, fracture repair, joint replacement, tendon and ligament injuries, muscle and joint injuries. 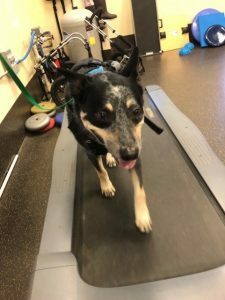 The Certified Rehabilitation Doctor and Technician work together to come up with a workout program you can do at home which fits the ability and individual needs of your pet. 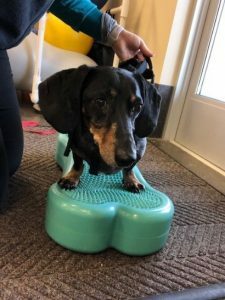 We work together with Canine Exercise Solutions to provide an at home program, you will receive a user name and password to go online and access your pets home exercise program. The program will have videos, pictures with selected exercises and instructions on how to perform them and how often. You may contact us anytime for assistance, or if you have any questions. 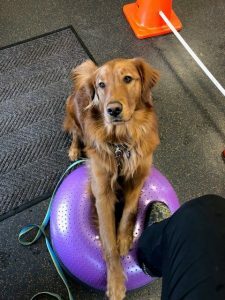 We proudly carry and use FitPaws® canine conditioning equipment. 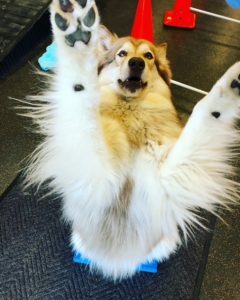 FitPaws® products are useful to help with stretching and strengthening your pet. 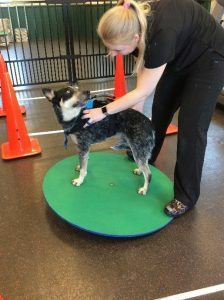 Allowing them to meet our rehabilitation and fitness goals. We can help get you the right equipment for you to use at home that will fit your pet’s ability and individual needs. We highly recommend the Help’Em Up Harness. This harness is great for helping your pet get in and out of the car, assisting in walking and helping your pet get around better. We custom fit the harness to your pet. 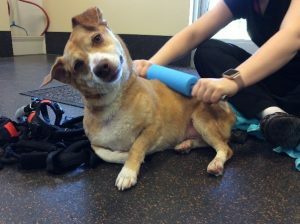 We offer Companion Laser Therapy. 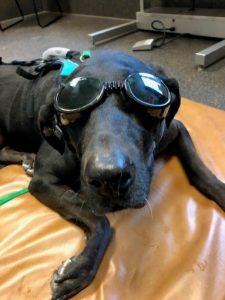 Laser Therapy is used to treat may conditions such as arthritis, tendonitis, wounds, trauma, lick granulomas, skin infections, tooth extractions, and post-surgical incisions. 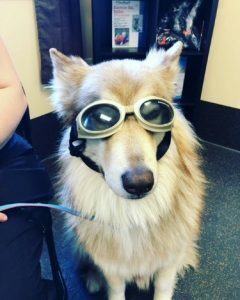 Laser Therapy reduces pain, increases circulation, decreases inflammation, and speeds up the healing process. 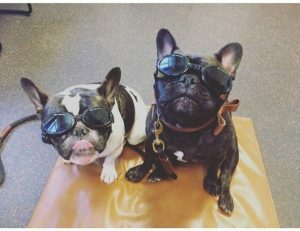 Laser Therapy is safe, noninvasive, and side effect free.